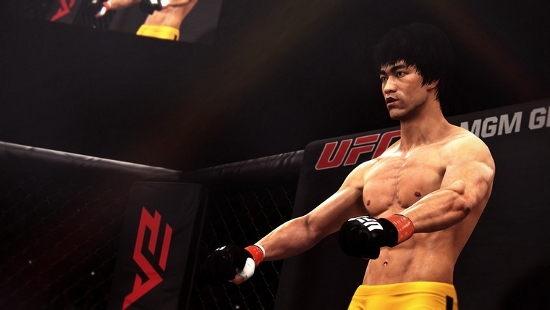 EA Sports has been teasing the addition of a mystery fighter for the upcoming launch of the UFC franchise and the clues made it immediately obvious that it would be Bruce Lee. Today the company confirmed that Lee will be on the roster available immediately to those who pre-order (unlockable by completing Career mode for those who don’t) and playable in four different weight classes (Fly, Bantam, Feather, Light). The deal is being offered through all retailers including Amazon however nothing has been mentioned pertaining to digital purchases. Along with that news the company has confirmed the release date as June 17. That’s technically the last day EA would be able to release it without slipping out of spring – which they have promoted as the scheduled time frame all along. In 2004 UFC president Dana White stated that he believed Lee was the “father of mixed martial arts” for his blending of styles so with that in mind it’s not a huge surprise that he would look to include him in a game out of respect and for the attention it would generate. The UFC even sells official Bruce Lee merchandise so the connection has been there. Lee has been one of the most downloaded created fighters in Fight Night and MMA but this year EA removed the feature and those with a cynical point of view will say his addition was the reason why. Regardless it’s questionable whether his presence will make for a legitimate selling point for consumers when he obviously never had any association with UFC (formed 20 years after his death) – and early reaction to the news appears decidedly mixed – but it’s a big name that will clearly be pushed hard in the marketing campaign.